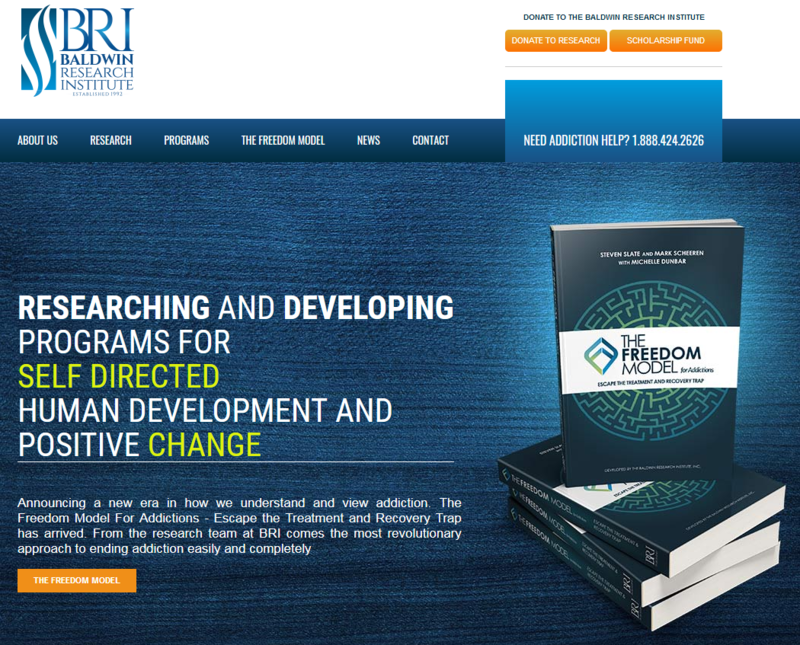 Founded in 1989, the Baldwin Research Institute’s mission is to research cutting edge drug and alcohol issues, educational methodology, and best practices for drug and alcohol problems and related issues; to guide the drug and alcohol treatment industry and recovery society as a force for change, and to honestly and objectively educate the public as to the effectiveness of treatment and prevention programs with respect to drug and alcohol use. Baldwin Research Institute first began its efforts in 1989 when it conducted a study of the modern Alcoholics Anonymous organization. Then, in 1990, the Institute began a study of 38 subjects with drug and alcohol problems. These studies were initiated to prove or disprove claims by Alcoholics Anonymous of success rates as high as 93% and claims by the treatment industry of success rates as high as 80%, but the claims of any single treatment program could not be validated with a success rate greater that 30%. Baldwin Research Institute continues its over a quarter of a century mission of research of substance use issues, methodology, and education. By disseminating its findings, BRI impacts the drug and alcohol treatment industry and the current “recovery society” as well as providing an objective resource for scientifically verified information for the general public to be more accurately and fully informed. The Baldwin Research Institute, Inc. is a New York State Corporation. The United States Department of Treasury has ruled Baldwin Research Institute to be a tax exempt corporation as described in section 501(c)(3) of the Internal Revenue Code. As such, the Baldwin Research Institute is registered with the New York State Office of the Attorney General’s Charities Bureau and the New York State Department of State Office of Charities Registration. Additionally, the Baldwin Research Institute has been approved by the New York State Supreme Court to conduct business as a not-for-profit corporation in the State of New York and has been approved by the New York State Department of Education as an institute conducting alcohol and drug research. Simply stated, every concept of addiction is built on the idea that in some way, a person’s substance use becomes involuntary. This is most often represented by the word “disease”, as we understand the symptoms of diabetes or cancer to be out of the direct control of the person suffering. But the “symptoms” of the supposed “disease of addiction” remain under the control of the “addict/alcoholic.” They control whether or not they use, and they control whether or not they crave. So, addiction is not a disease. It is a pattern of fully freely chosen behavior based on personal preference. The sooner we recognize that it’s choice rather than disease, the sooner we can effectively help people. 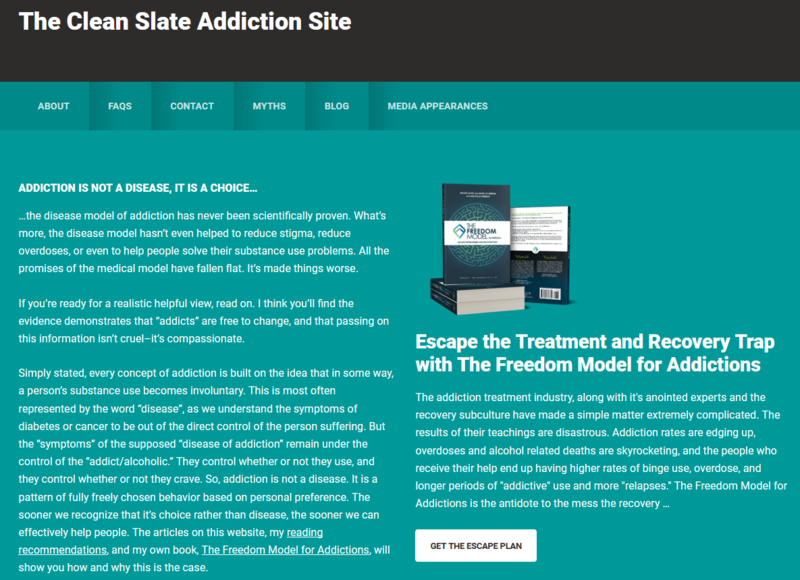 The articles on this website, my reading recommendations, and my own book, The Freedom Model for Addictions, will show you how and why this is the case. I hope you’ll use these resources to help change our culture’s understanding of addiction, and help people out of the trap of self-defeating ideas about drugs, alcohol, and addiction. Oh yeah, if you want to know more about me, please watch my TEDx Talk on addiction, and check my About page.